The tasty filling sandwiched in the middle of two Copa del Rey ties between these two sides is Sunday night’s league meeting at Mestalla, with Real Madrid having enjoyed their recent trips to Valencia. The Spanish champions have scored 12 goals in their last three tips to the east coast, and Bet365 price them at 8/11 (1.72) to record a fourth successive win at Mestalla. Yet before punters rush out to back Madrid at what may seem a huge price, it is worth remembering the relative importance of the league to both sides. Lying 18 points behind Barcelona in the table, Madrid are likely to prioritise the cup over the defence of their title, with Valencia in turn much more focused on gaining points to finishing in a Champions League spot. The price of 7/2 (4.50) for a home win may appeal to many, especially when considering Madrid’s away form which has seen them win just one of their last six matches on the road in all competitions. 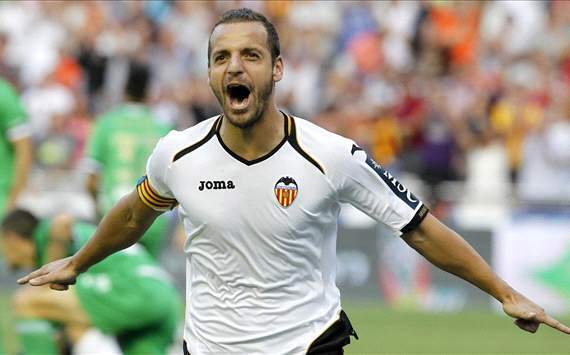 Yet instead of backing either team to win, a wiser move might be to delve into the scorer market, where the price of 6/4 (2.50) for Valencia’s Roberto Soldado to score at any time is of great appeal. The Spanish international is in great form, netting 17 times in all competitions this season and was unlucky to be denied a couple of clear scoring opportunities when the sides meant on Tuesday in the cup by some dubious offside decisions. Having scored three goals in the last two games against Madrid in Valencia, he offers great value in the any time scorer market and should be well backed. For a value bet back a high-scoring encounter with over 4.5 goals offered at 3/1 (4.00) and paying out in each of the last three meetings at Mestalla. This entry was posted in Club news on 20/01/2013 by mirsinho.